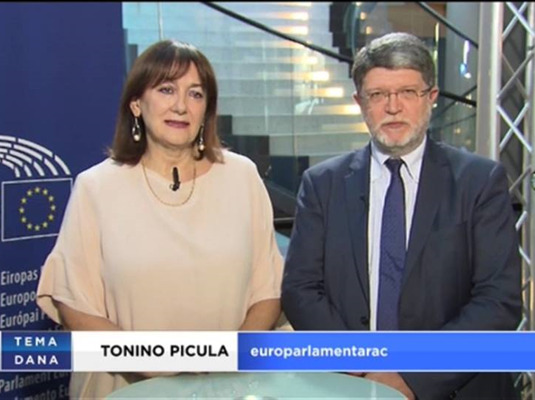 MEP Tonino Picula and his colleague Dubravka Šuica talked for Croatian Television, after German partners in the CDU and CSU government reached a compromise solution on migrants. They commented how will the German agreement affect other countries that will eventually have to accept migrants who first registered at Germany when coming to the EU, live from the European Parliament. "This is not a migration crisis but a deep political crisis in the EU disguised as a migrant crisis. Because of the crisis of the ruling coalition in Germany, Chancellor Merkel proposed sending German border police officers to the borders of Slovenia and Bulgaria. Since we have a Schengen border with Slovenia, and at the same time the longest external border of the EU, I emphasize that Croatia must not be left out of such partial agreements", said Tonino Picula speaking for HRT, live from Strasbourg. You can see the whole show at the link.